Ever wondered what makes a beer taste different from the next? This year, the 5 downtown Portsmouth breweries have banded together to create a series of “Brewer’s Discretion” ales to demonstrate just that. 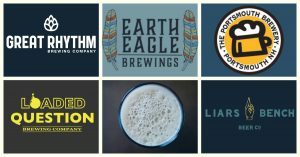 Great Rhythm, Liars Bench Beer Co., Loaded Question, Portsmouth Brewery, & Earth Eagle Brewings have traded signature yeast strains to create a collaborative series of unique pale ales designed to be compared, contrasted, & consumed! Individual releases will be staggered throughout Portsmouth Beer Week, with a final serving of ALL 5 of the Brewer’s Discretion ales tapped at noon for comparison at Earth Eagle on Sunday, March 3rd! This years base beer consists of: 2-row barley, pilsner malt, wheat malt, a touch of aromatic malt, & flaked oat. All beers are brewed with American cascade hops, highlighting yeast as our variable for this years series. – Sunday, 3/3 @ 12:00 PM: Earth Eagle Brewings brewing with S11 French Saison Yeast from Portsmouth Brewery.